Link Configuration: The process of setting up and negotiating the parameters of the particular NCP link (once an LCP link is established) is accomplished using Configure-Request, Configure-Ack, Configure-Nak and Configure-Reject messages just as described in the LCP topic, except these ones are particular to the NCP. The configuration options are of course different; they are the network layer protocol parameters being negotiated. Link Maintenance: Code-Reject messages can be sent to indicate invalid code values (NCP frame types). The overall operation of the NCPs, such as IPCP, is very similar to that of LCP. After LCP configuration (including authentication) is complete, IPCP Configure-Request and Configure-Ack messages are used to establish an IPCP link. IP Data can then be sent over the link. If the IPCP connection is no longer needed it may be terminated, after which the LCP link remains open for other types of data to be transmitted. 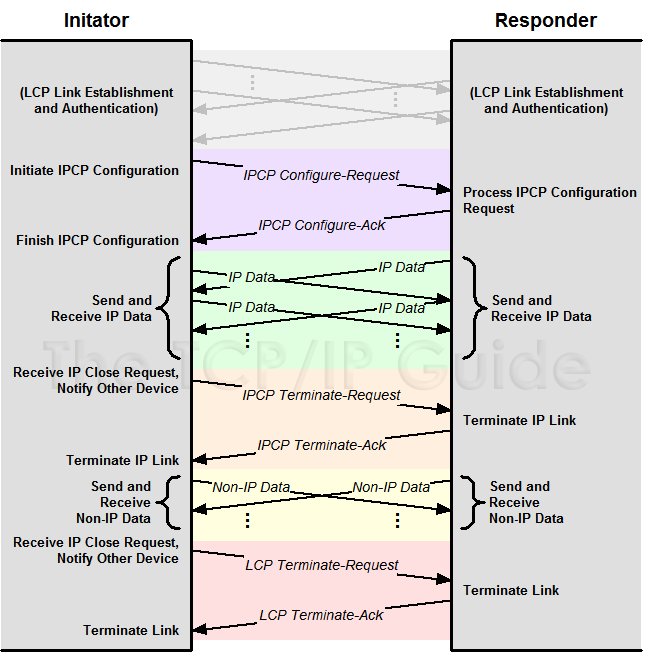 It is not necessary, however, to explicitly terminate the IPCP link before terminating the LCP connection. Key Concept: After the primary PPP link is established using LCP, each network layer protocol to be carried over the link requires the establishment of the appropriate NCP link. The most important of these is the PPP Internet Protocol Control Protocol (IPCP), which allows IP datagrams to be carried over PPP.